Step by Step instructions on how to import 1099-DIV data from CSV or Excel file. Our 1099 DIV Software can import recipient information, 1099 DIV amounts and other form 1099-DIV boxes from CSV format. CSV (comma separated value) is the most common format used in order to transfer data between different types of databases. 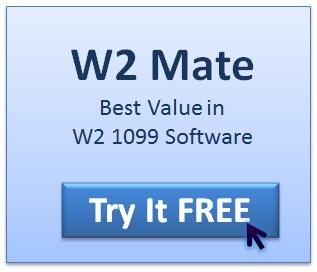 Most software and database applications will allow you to export 1099 data into CSV format, which can then be imported into W2 Mate. If your software exports data to Microsoft Excel format, you can save the Excel file as CSV (Comma Delimited) and then do the import into W2 Mate. (1) Go to Import Data>> 1099-Div Forms (CSV – Excel). (2) Select the character that is used to separate data categories (columns). The default value should be OK in most cases. (3) Select the character that is used to enclose strings. The default value should be OK in most cases. (4) Select the input 1099 DIV text or CSV file you are trying to import. (5) Once you select the input file you should see a preview for the contents of the file (1099 DIV data columns). (6) Map the data by clicking with the Left mouse on each of the columns. (7) Once you have defined all the required fields, hit the Import button to import the new data. Recipient’s Name (Line Two) Text field, maximum 38 characters long. If you are trying to import 1099 DIV from QuickBooks, Great Plains, Microsoft Dynamics, DacEasy or Sage Peachtree you can use the import wizards specific for each software. Start printing form 1099 DIV today, visit our 1099 software page.